Kellyanne Conway, counselor to President Donald Trump, has a now familiar and well-rehearsed South Jersey narrative. Abandoned as a child by her father, John Fitzpatrick, she has often spoken of being raised in tiny Atco, a section of Waterford Township, Camden County. She has repeatedly told of a rearing by the strong Italian-American women in her life: her mother, Diane Fitzpatrick, a single-mom who worked at the Claridge as a casino gaming supervisor, plus two never-married aunts, Rita and Marie DiNatale, and her grandmother, Antoinette DiNatale. Part of her official life story – she’s so South Jersey that her Secret Service code name is “Blueberry” – is growing up in a family of limited means and making ends meet through hard work and the support of the women in her extended family. 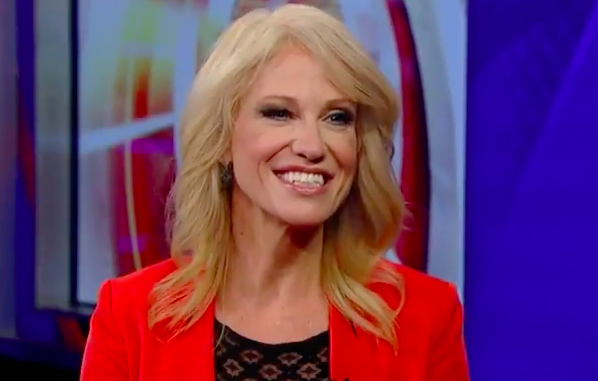 Conway is the first woman to lead a winning presidential campaign. That’s the narrative she told again most recently in an exhausting, if not exhaustive, 7,000-word-plus New York magazine cover story, which dubbed her “The Real First Lady of Trump’s America." Perhaps Conway neglects to mention him because her grandfather didn't live with her family in Atco, but rather nearby in Hammonton. A former law enforcement officer, who asked not to be identified, confirmed the separate living arrangement of her grandparents, but he could not answer why Jimmy and Antoinette DiNatale maintained separate homes, or even if they were divorced. Perhaps because he helped facilitate the bloody rampage of Philadelphia crime boss Nicodemo "Little Nicky" Scarfo in the early 1980s, according to law enforcement officials. Veteran organized crime journalist George Anastasia, who has chronicled the mob in South Jersey and Philadelphia since the late 1970s, and is an occasional contributor to PhillyVoice, said Conway’s personal narrative appears to be her own version of the truth obfuscation employed by the Trump administration. White House senior adviser Kellyanne Conway appears on MediaBuzz on FOX News on March 12, 2017. Jimmy DiNatale allegedly made his money as a young bootlegger, according to New Jersey law enforcement officials. “The Brute” allegedly used his bootlegging cash to found multiple businesses in South Jersey, including several bars and some apartment buildings, according to those officials. And he allegedly provided a false alibi for Scarfo and two confederates, his nephew Philip “Crazy Phil” Leonetti and Lawrence “Yogi” Merlino. Authorities have alleged in detail that Conway’s grandfather and his close friend, one-time Hammonton bar-owner Sam Siligato, also alleged to be a mob associate, each lied about the whereabouts of Scarfo and his confederates during their 1979 murder of Margate cement contractor Vincent Falcone. The false alibis by DiNatale and Siligato were presented first to an unwitting investigator for Scarfo’s defense team at Siligato’s Hammonton bar, Silly Gator, according to the 1992 report, and are part of what led to acquittals for Scarfo, Leonetti and Merlino in Falcone's murder. Scarfo died in January, still in federal prison on subsequent convictions. Merlino, who became a federal witness, died of natural causes in 2001. Leonetti, who also became a federal witness and remains in hiding, appears to be the source for much of the 1992 crime report concerning DiNatale. A fourth man who witnessed the slaying of Falcone, Joe “The Plumber” Salerno, appears to still be in hiding after having become a protected witness just a week after the shooting. Unable to reach Salerno directly for retribution, a gunman allegedly working for Scarfo shot Salerno’s father at his Wildwood motel, though he survived the hit. Siligato is still alive, in prison after convictions on two unrelated charges of arson, plus insurance theft and tampering charges. He is due for release in June 2018. Conway, whose husband, George T. Conway III, is expected to soon join her in the Trump administration as the head of the civil division of the Justice Department, did not respond to repeated requests for comment over two days made through her assistant in the White House. 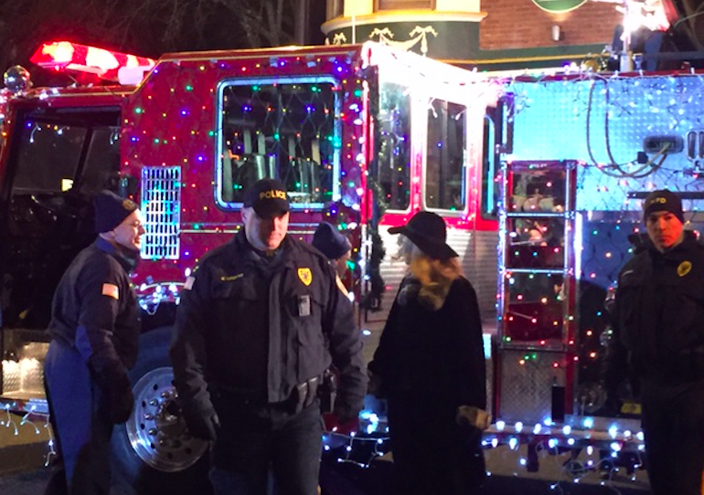 Kellyanne Conway returned to Hammonton for the town's fire department's annual Christmas parade in December. The not guilty verdict set the stage for Scarfo to go on to a ruthless and bloody reign over organized crime activity from Philadelphia to Atlantic City until 1987, when he finally was jailed permanently, convicted for crimes committed after the Falcone hit. At Scarfo’s behest, at least 25 organized crime figures were killed between 1980 and 1985, according to law enforcement officials. “If you accept that he (DiNatale) was a key witness, then the alibi changed the whole dynamic” of what came afterwards during Scarfo’s brutal reign, said Anastasia, who covers mob developments these days for bigtrial.net. Scarfo and Leonetti liked dealing with DiNatale because he knew their background and was willing to accept cash without asking any questions. Among the things that Scarfo and Leonetti planned to buy from DiNatale were his bars, a fuel oil company, a vending business, apartment buildings, a construction supply company and various other properties. He also owned a car dealership, but they weren’t interested in that. Leonetti knew from his conversations with DiNatale and Scarfo that DiNatale used the money he had made from bootlegging during his younger years to invest in legitimate businesses and real estate in the Atlantic County area. Shortly after Scarfo became boss, he and Leonetti started to make a lot of money and Scarfo wanted to begin buying DiNatale’s assets. However, the only thing they ever purchased was one piece of property because Scarfo went to federal prison only a year and a half after becoming boss. DiNatale died May 1, 1983, while Scarfo was still in prison. Leonetti attended DiNatale’s wake with Lawrence Merlino and (lawyer) Harold Garber. The property purchased by Scarfo and Leonetti was about four acres of land in Galloway Township, N.J., which they acquired in the name of Scarf Inc., the 1992 state report alleged. It also claimed they paid DiNatale $40,000 for the property, though it was documented as a $30,000 sale, with Leonetti giving DiNatale $10,000 in cash. Kellyanne Conway is a member of the DiNatale family, a familiar name in Hammonton and Atco. Her uncle, an Atlantic County developer named Jimmy DiNatale, paid for the Trump billboard on the Black Horse Pike leading into Atlantic City. DiNatale's death came in the middle of Kellyanne Conway’s teen years, just a year after she was crowned Hammonton’s Blueberry Princess and just before she was named the fastest blueberry packer in the state. It was also two years before she graduated from St. Joseph’s High School, a Catholic school in Hammonton, where the former cheerleader returned last December to lead the town fire department’s Christmas parade, an invitation that led to cheers – and some jeers. A member of Conway’s family, her uncle, Jimmy DiNatale, is still an active businessman and developer in Atlantic County. 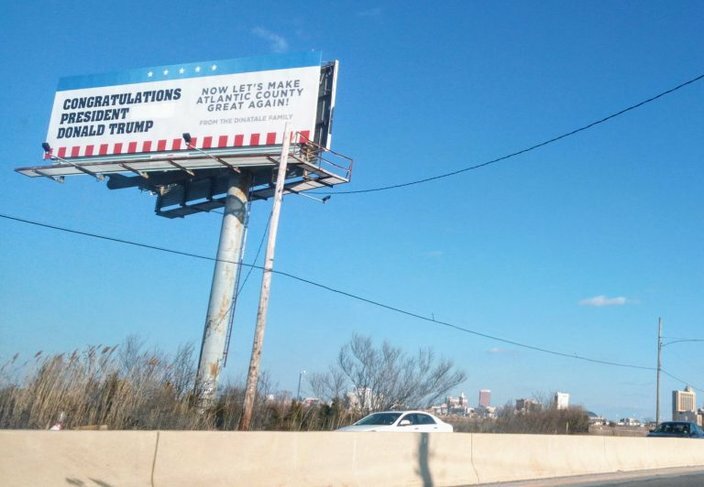 Before the presidential election, Jimmy DiNatale paid for billboards promoting the candidacy of Donald Trump. Later, they were updated to congratulate Trump on his win, adding “Now let’s make Atlantic County great again. Conway’s uncle is currently locked in a dispute with the Casino Reinvestment Development Authority in Atlantic City, according to the digital news site, Route 40. Jimmy DiNatale had traded an Atlantic City strip bar he owned on Indiana Avenue, known as the Rio, for a CRDA-owned property at 2231 Arctic Ave. He’d hoped to build a Hooters restaurant and bar and run a fleet of amphibious boat tours out of the location, each with a Hooters girl along for the ride. But the location, he discovered, has serious and costly environmental and contamination issues. DiNatale and the state agency are squabbling over who is responsible for cleaning up through their lawyers. He recently painted the building hot pink, an apparent thumb-to-the-nose directed at the CRDA.